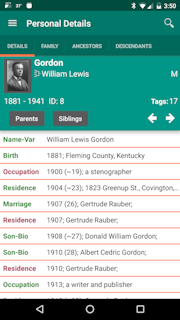 GedStar Pro is an Android app that lets you view all of your genealogy data in detail on your Android smartphone or tablet. 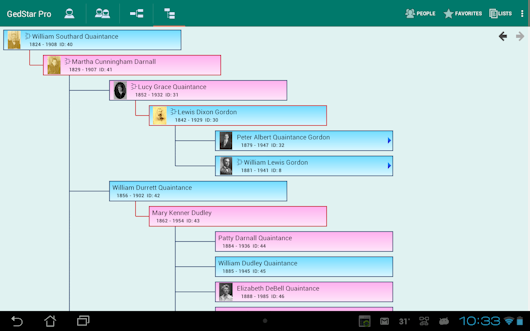 A companion Windows program is used to extract and convert the data that is stored in a genealogy program on your PC. The resulting file is then transferred to your device for easy and convenient viewing. The app runs on any Google-approved device that uses Android version 4.0 through the latest version 8 (Oreo). Effective 1 Jan 2018, GedStar will be removed from the Google Play app store and will be available only directly from this website. It has become too difficult to support this product due to the numerous changes in Windows, Android, and the genealogy software landscape and their respective development tools. Future changes, if any, will be noted here in the change log and made available on the download page. Thank you for your support over the years on our journey from Palm Pilots to the latest smartphones! À compter du 1er janvier 2018, GedStar sera retiré de l'app store de Google Play et sera disponible uniquement sur ce site. Il est devenu trop difficile de supporter ce produit en raison des nombreux changements dans Windows, Android, et le paysage des logiciels de généalogie et de leurs outils de développement respectifs. Les changements futurs, le cas échéant, seront notés ici dans le journal des modifications et mis à disposition sur la page de téléchargement. Merci pour votre soutien au cours des années sur notre voyage de Palm Pilots aux derniers smartphones! Ab dem 1. Januar 2018 wird GedStar aus dem Google Play App Store entfernt und ist nur direkt von dieser Website verfügbar. Aufgrund der zahlreichen Änderungen in Windows, Android und der Genealogiesoftwarelandschaft und deren entsprechenden Entwicklungstools ist es zu schwierig geworden, dieses Produkt zu unterstützen. Zukünftige Änderungen, falls vorhanden, werden hier im Änderungsprotokoll vermerkt und auf der Download-Seite zur Verfügung gestellt. Vielen Dank für Ihre Unterstützung im Laufe der Jahre auf unserer Reise von Palm Pilots zu den neuesten Smartphones! Main Person view with list of events. Family view with spouse and children. 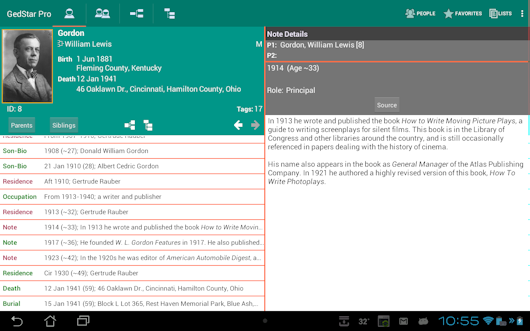 Support for large (10-inch) tablets provides various side-by-side views for easier navigation and better viewing of details. 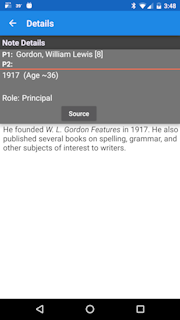 Person view with event list and tree navigation panel. Family view with spouses and children. 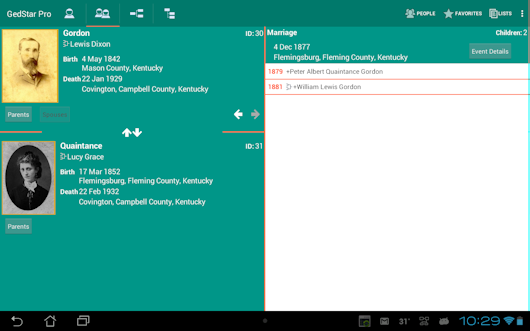 Event details in right-hand pane. 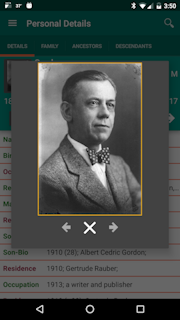 Photos are also displayed in the right-side pane. 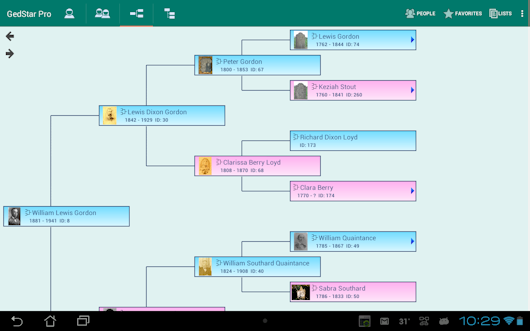 Person view with descendant navigation pane. 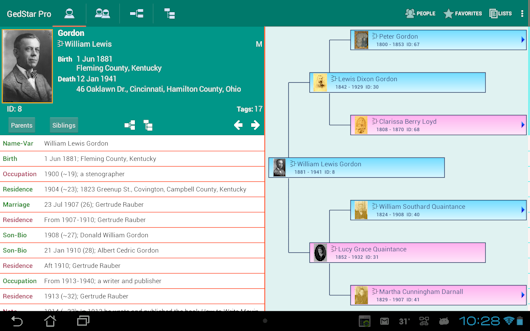 Run GedStar Pro on your PC to convert from your genealogy program or GEDCOM file. Copy the converted database to the file storage on your device using a USB cable, or use the third-party Dropbox or Google Drive service to transfer it wirelessly through the cloud. 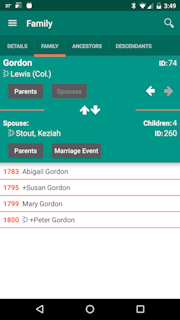 Run GedStar Pro on your Android device to view all your data! 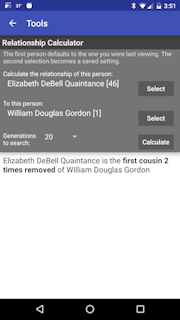 Direct import of data from The Master Genealogist and Legacy Family Tree. 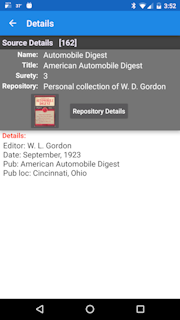 Import of GEDCOM files to support all other genealogy programs. 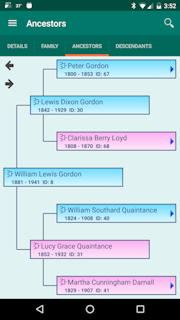 Display of photos (including those linked from GEDCOM files). No known limitations on the amount of data that can be handled. Selectable options on what data to include. 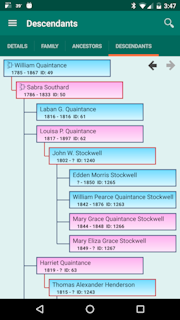 Graphic indicator for your direct-line ancestors. Show locations on Google Maps by place name or GPS coordinates. Support for your To-Do List or Research Log (Legacy and Master Genealogist only). Several ways to navigate from person to person (and back!). 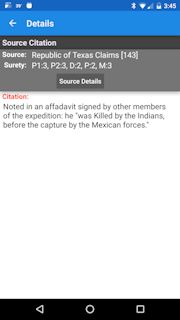 GedStar Today widget for daily reminders of important events on your smartphone or tablet's screen. 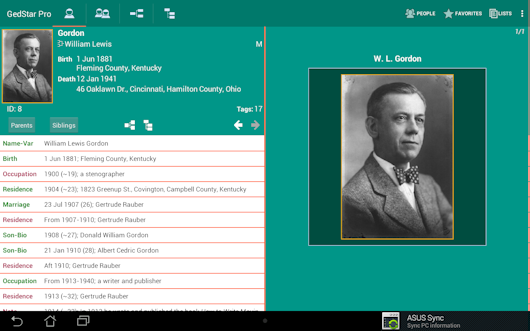 The latest version of the product can be downloaded from this site for the Windows application as well as the Android app. It is no longer available on the Google app store.